Local Beer Blog: First Taste with Burial Beer Co.
Doug and Jess Reiser met Tim Gormley in Seattle while drinking "Glacier Fresh" Kokanee lager. From that point on, Tim introduced the couple to the world of craft beer and Burial Beer Co. was destined for North Carolina. Perhaps most influential on their business plan was a March 2010, ten-day "research" trip to Belgium, where the trio encountered breweries of all shapes and sizes. They sampled dozens of Belgian ales unlike anything available in the US. They met one brewer who was highly successful brewing small batches out of his farmhouse. Success after all isn't dependent on the size of your brewhouse or your distribution area. It's something much more philosophical: Are you happy doing what you love to do and are you making a living doing it? To start out, Burial Beer Co. will be a one-barrel brewery and neighborhood taproom. Coming from Seattle (where they ran a successful beer blog), Tim, Jess, and Doug have seen a number of nanobreweries start small and grow into much larger operations. Long-term plans involve opening a 15-barrel production brewery on a farm in the vicinity of Asheville, where they will use homegrown ingredients in a variety of creative farmhouse brews. They plan keep the downtown taproom as a pilot brewery and to stay connected with the city of Asheville. Burial Beer Co. recently moved into their space at 40 Collier Avenue and are in the process of renovating the building and getting their federal and state licenses in order. Tim Gormley, who brings experience from Lazy Boy Brewing and Sound Brewery, will make mostly Belgian and German styles with the occasional American "flavor bomb." He plans to use local ingredients whenever possible, including North Carolina malts from Asheville's Riverbend Malt House. Be on the lookout for a special grand opening beer, Skillet Breakfast Stout, also brewed with Biltmore coffee. 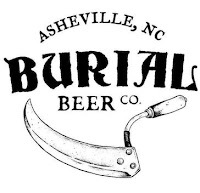 Brews will be draft only for starters, but Burial Beer Co. plans to offer 32 oz. bombers to-go. It will be exciting to watch Burial Beer Co. as it joins the Asheville beer community and grows into the vision that Doug, Jess, and Tim have for it. I wish them the best of luck. Follow Burial Beer Co. on Facebook and Twitter so you don't miss the announcement of their opening date.